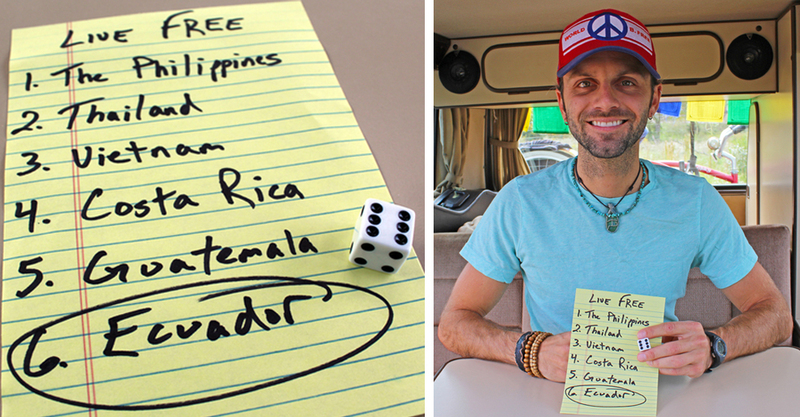 I listed 6 countries on a piece of paper and rolled a die…I’m moving to Ecuador! Since thru-hiking the Appalachian Trail in 2012 I’ve been dreaming of living minimally, creating a career that would allow me to work from anywhere, and moving abroad to live in a foreign country for an extended period of time. It’s taken several years, lots of hard work, and a few very difficult decisions, but I’m finally making that dream a reality. The first step was downsizing my physical footprint, moving out of an apartment, and living full time in a van. Next I quit my “real job” and took a chance on freelance income, leaving the cubical, work schedule, and location based career behind. The only thing left was to pick an international destination, pack my bag, and go. With those points in mind, I began researching digital nomads, people who work via the internet from anywhere, and picked 6 countries that sounded cheap, interesting, and most importantly, warm. I wrote them down on a piece of paper, numbered them 1 to 6, grabbed a die, and gave it a roll. The white cube bounced, slowed, and came to a rest with six black dots facing up. Number 6. Ecuador. Well, I don’t really have one. I booked a one-way flight next week to Quito, Ecuador. That’s about as far as I’ve planned. I’ll spend the next few months living out of my backpack, touring the country, working whenever I can find WiFi, visiting Rotary Clubs, making new friends, and immersing myself in the local culture. I want to see the Amazon, the Andes, the Galapagos Islands, and whatever else I stumble across. I don’t know when I’ll go where, who I’ll meet, or how I’ll find internet connections to get work done, but that’s the point. I don’t want to know, I’ll just figure it out. Living in Ecuador won’t exactly be easy. I spent the majority of my 3 years in high school Spanish class goofing off. As a result, the only Español I can recall is cerveza, el baño, and a few swear words. Unless I’m in a back alley cantina, I’m pretty much screwed. I’m nervous about being out of my comfort zone, in a place where I don’t know the spoken language, without having any structured plans, but that’s not so bad. Many friends have asked if I’m worried about my safety. Not really. Bad things can happen to anyone anywhere, even at home, and I’d rather take a chance of something bad happening to me while I’m on an epic journey than miss out on this experience. I don’t generally take unnecessary risks at home, and I don’t intend to start in South America. Ultimately, stuffing my entire life into one backpack and setting off for a new country where I know no one and barely speak the language is a little scary, but in a good way. I don’t want to live my life comfortably, smothered by mundane routine, always wondering what it would be like to just drop everything and go. At the end of my life I’d rather regret the things that I did do than the things that I wish I’d done. ¡Adios America! You are going to love it! The Galapagos Island of Isabela was the most incredible place I have ever been. The Amazon region on the Cueybeno River is amazing! OMG have fun!! Any luck finding good spots to work in? I am headed there with my laptop in a month and am trying to research where has the best wifi! Christa, yup! I’ve had no problem in Ecuador. I mostly work from hostels, but sometimes cafes. Some of the hostels in big cities have had faster internet than some places in the United States! Other times I have struggled a bit with wifi that dropped or was slow, but when that happened I could just move on to another hostel. Have fun, it is a beautiful country!